This weekend, North Korea successfully tested a medium long-range strategic missile, a weapon their official Korean Central News Agency says can carry a nuclear warhead. According to the Associated Press, the missile launched on Sunday, Korea time, was a Hwasong-12. South Korean, Japanese, and American militaries tracked the weapon’s flight, confirming that it flew for half an hour and achieved a significantly high altitude. Ultimately, it touched down in the Sea of Japan. 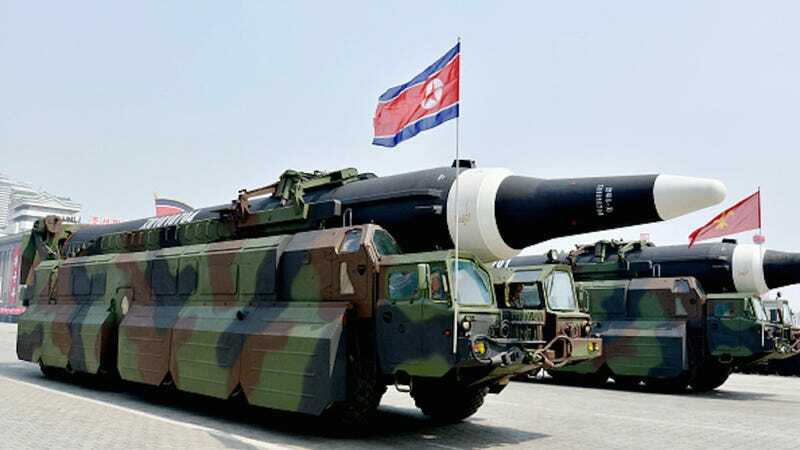 Japanese officials observed that the Hwasong-12's flight pattern could signal a “new type of missile.” It traveled 800 kilometers (500 miles) and acquired an altitude of 2,000 kilometers (1,240 miles). But now the White House is backpedaling on the idea of holding an audience with North Korea. This entire situation is extremely disagreeable, and it’s an especial bummer that our president—the individual most responsible for the country’s diplomatic success—is a frumpy and unprincipled nitwit.